Clay disk which found at 1908 under the ruins of the first palace of Phaistos, considered to be constructed in the period between 1700-1600 BC. It has a diameter of 17 cm and has an inscription on it's both sides in an unknown language, which has a spirally direction from the circumference to the center. 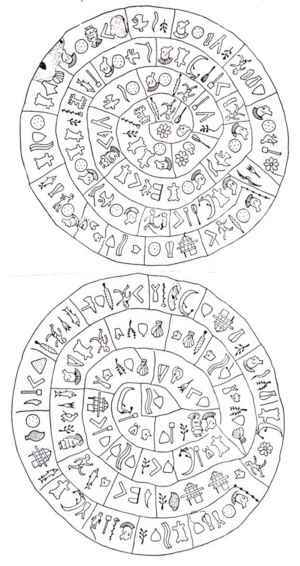 The alphabet of the disc consists of 241 independent and 61 common signs, which seem to be a mixture of syllabic and hieroglyphic writing. The elements had been stamped on the disc with small seals before been cooked in ceramic kiln. The most frequent sign, is the appearance of a warrior head with a cover which resembles the Philistine helmets. Arthur Evans assumed that the script came from the Asia Minor and probably from Lycia, and argued that the text was an anthem in the honor of the goddess Cybele. Others believe that the document regulated the transactions between the rulers of Phaestos and the East. This is one of the most famous works of art of the Minoan civilization, while the enigmatic nature was the subject of intense interest by many scholars, who occasionally made possible proposals for the precise character of the disc.